Are you selling eBooks on your WordPress site using WooCommerce or WP eStore plugin? What happened if someone buys your PDF eBook and the buyer reselling the eBook or distributing in free of cost? So it would be really great if you find a way which can discourage buyers from sharing or reselling your eBooks. In this post, I am going to tell you about a great WordPress plugin which can be integrated easily with WooCommerce and WP eStore plugin and place buyers info as a watermark or like a stamp. WP PDF Stamper is a WordPress plugin that can dynamically stamp a PDF file that you sell on your WordPress site using WooCommerce or WP eStore plugin. It will stamp customers details like name, email, address etc. Why is it important to stamp your PDF eBook that you are selling? 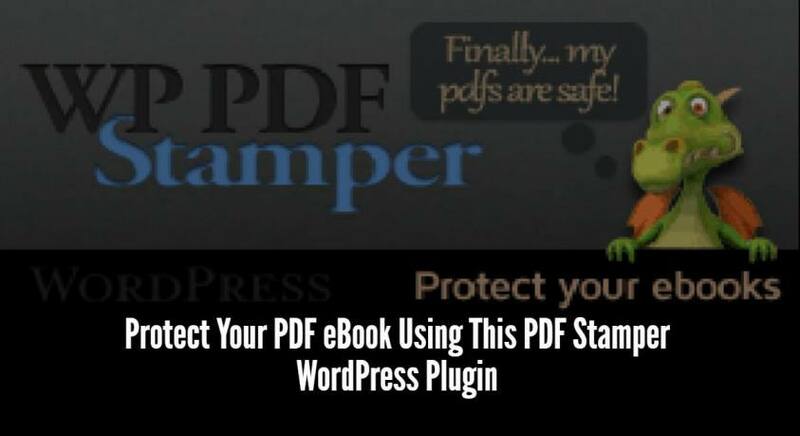 The main purpose of stamp your eBooks is to protect your eBooks from being shared. It is a proven fact that PDF eBooks that are stamped with buyers personnel details are less like to be shared on the internet and it discourages buyers to resell your eBook. Thus you can stop losing your sales for being shared. Your eBook is the result of your hard work. So you would not like it to be shared and distribute freely and you are not making a profit for this. It helps to personalize your eBook. Track the source of shared files. Protect your eBooks from being shared on file sharing websites. Password protection of your stamped PDF files with the customer’s email address or with a fixed password. Stamp the customer’s details to the header or footer of every PDF eBook that you sell. This plugin can automatically stamp PDF files to prevent users from being able to copy, modify or print the content of the file. Easily can be integrated with ClickBank so you can sell your PDF eBooks via ClickBank. Read details about it here. This PDF stamper plugin can be easily integrated with the popular WooCommerce plugin. That means you can stamp your PDF eBooks that you are selling on your WooCommerce base WordPress site. Also, this plugin can be easily integrated with WP eStore plugin. To know about more features of this plugin you can visit the plugin page on Tips & Tricks HQ.